No time to cook? No problem! These quick & easy keto dinner recipes are ready to serve in 30 minutes or less! You know, I once thought for a meal to be swoon-worthy one must slave for hours over a hot stove out of love for their family. The truth is, you can cook amazingly flavorful, nutrient-dense dinners faster than you can get take out. Cooking at home is the healthiest thing you can do for yourself, your family and your budget! The following collection of low carb dinner recipes will prove it! Whether you’re looking for a better for you version of your favorite Chinese stir-fry takeout meal, or low carb recipes with chicken, beef, pork or fish that are ready to serve in 30 minutes or less you’ll find a new time and sanity-saving meal today! This post may contain affiliate links. For more information please see my disclosure policy here. Need More Quick & Easy Dinner Recipes? Check out the Keto In Five Cookbooks! 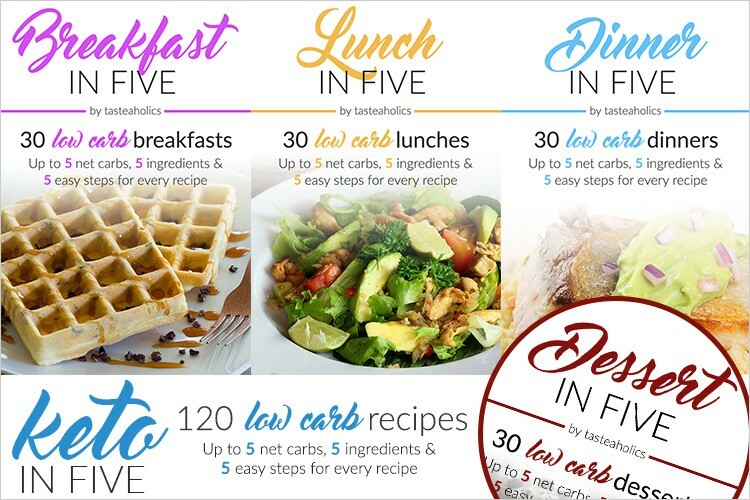 Over 120 Low Carb Recipes that use 5 ingredients, 5 steps & contain 5 carbs or less! Don’t forget to save these Quick & Easy Keto Dinner Recipes!